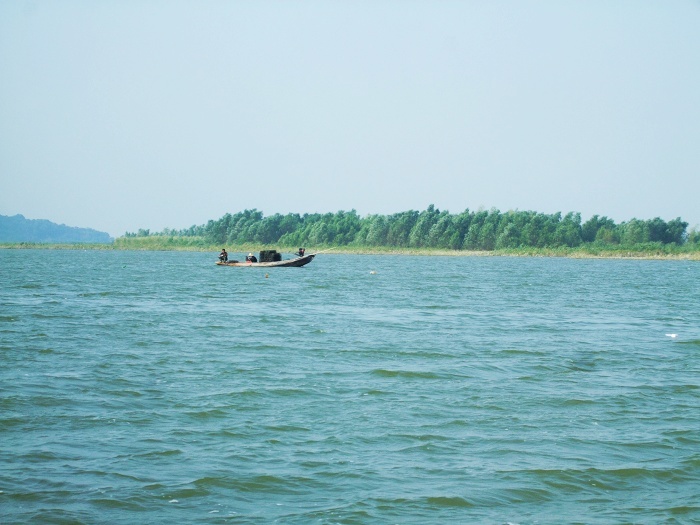 Lake Dongting is located to the south of the Jingjiang River in the lower reaches of the. Changjianga~River in north Hunan Province, The Xiangjiang River, the Zijiang River, the Yuanshui River, and the Lishui River-known the "four rivers", and the Miluo River, the Xinqiang River, the Xiangyang River, and so on, lie to its west, south, and east. And to its north are three flood discharging outlets of the Changjiang River at Songzi, Ouchi, and Taiping (plus the one that has blocked up at Tiaoxian known as the "four outlets"). However, the lake has only one outlet at Chenglingji into the Changjiang River. The lake has now a surface area of 2 691 square kilometer. with a storing capacity of'17.8 billion m3. The total drainage area of its water system is 262 800kin2, taking up about 14% of the total drainage area of the Changjiang River. With an average annual runoff of 166.15 billion cubic meter, Lake Dongting is the most important catchment and flood storing basin of the Chaniang River. Because of serious silting up, the lake has been divided into the Southern Dongting Lake (917 square kilometer), the Eastern Dongting Lake (1 478 square kilometer); and the Western Dongting Lake (about 345 square kilometer). Lake Dongting is a typical lake of "swallow and spilt" type that stores and regulates flood.It also has the function of irrigation, shipping, fishery, water supply, receiving water, regulating the climate, and bettering the environment. 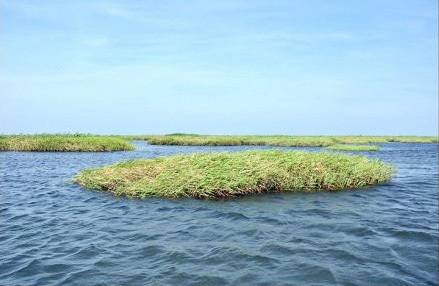 The lake region has fertile soil, temperate climate, sufficient rainfall, and rich natural resources. It is one of the important production bases of commercial grain, fresh water fish, cotton, and fiber crops. Environment of the Lake and Its Hydrological, Physical, and Chemical Characteristics. The lake region of Lake Dongting usually refers to the lower reaches of the lake itself, the lower reaches of the four rivers of the Xiangjiang, :he Zijiang, the Yuanshui, and the Lishui, the flood course of the Changjiang River leading to the lake, and the areas protected by the dikes, stretching across Hunan and and Hubei Provinces, with a total area of 18 780km2, of which 15 200kin2 is in Hunan Province, taking up 80.9%. The water system of the lake is composed of the Xiangjiang River, the Zijiang River, the Yuanshui River, the Lishui River, the Miluo River, the Xinqiang River, Lake Dongting, and other natural lakes, running through seven provinces of Hunan, Jiangxi, Guangdong, Guangxi, Guizhou, Sichuan, and Hubei, with a total drainage area of 262 800km2, of which 77.94% is in Hunan Province.